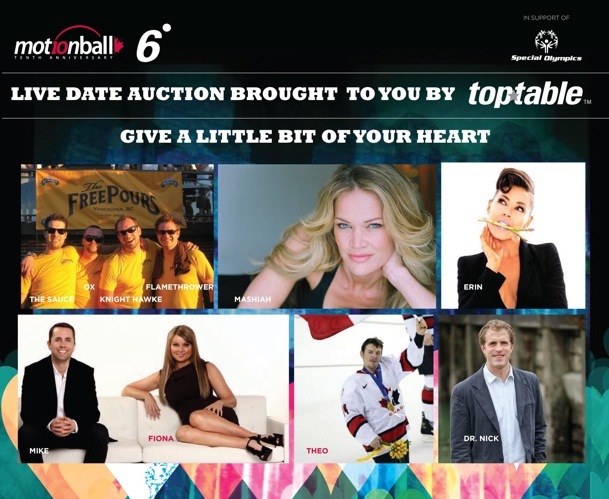 If you love talking food and indulging in Top Table restaurant creations, you should bid on me this Saturday night at motionball and Six Degrees’ Special Olympics fundraiser event. The winning bidder will also receive three frozen loaves of collector’s edition ‘It’s To Die For Banana Bread’ signed by Canucks’ Alex Burrows, Mason Raymond, and Mikael Samuelsson. View the items and videos of their signings here. Your donation will not only help fund Special Olympic athlete training, it will (in a roundabout way) buy you a delicious dinner full of food-related convo. Urban Rush’s Michael Eckford will also emcee the sixth annual event, which guarantees the night to be a blast. The fundraiser’s events will include a live date auction, a silent auction, and a performance by the Burlesque Beauties. Click here for full event details and ticket info. See you there! You can follow motionball on Twitter here. *Please note, the date to ensue will be platonic.